Pictures of veterans from Russia and Ukraine will be displayed in Moscow in April. As part of the commemorations of the 70th anniversary of the end of World War II in May, Arthur Bondar hopes to publish a book of 70 of the portraits. For more than five years, photographer Arthur Bondar has been taking portraits of World War II veterans from Russia and Ukraine on Polaroid film. After taking each picture, Bondar asks the veteran to sign the image. Photographs from the project, called “Signatures of War,” have appeared in magazines and exhibits around the world. As part of the commemorations of the 70th anniversary of the end of World War II in May, Bondar hopes to publish a book of 70 of the portraits. He recently launched a crowdfunding campaign at Planeta.ru to raise money for the publication. Elena Bobrova of RBTH spoke with Bondar about the project. RBTH: Why was it so important for you that veterans should leave their signatures on the Polaroid photos? Arthur Bondar: We leaving many traces after our lives are over. These traces are usually our letters, diaries or photographs. When I started this project, I found a letter from my paternal grandmother Galina Kondratievna Bondar, who was a veteran. She described her life during World War II in great detail. I also found a lot of photographs in her archive with signatures on the backside. All of these things made me think of using signatures and adding one more layer to the project. The Polaroid camera was the perfect tool for it. Today we can tell a lot about a person’s character from this signature using graphology. I think signatures can tell a lot of things about us. RBTH: What was so touching in your grandmother’s letter that encouraged you to start you project? How old she was during the war, and what was she doing? A. B.: Actually, the main impact of this project was the death of my maternal grandmother. She was a World War II veteran. So I thought a lot about how to keep the history of these people and to create a powerful story. Because my paternal grandmother and her sister were still alive, I decided to make a project about veterans. So I came to my grandmother and began to ask her about World War II. Then she gave me the letter where she described her life during the war. 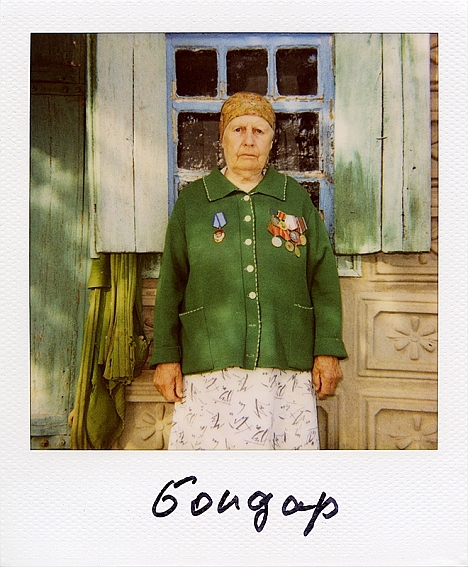 German solders came to her village, Ivangorod [150 miles from Kiev], in central Ukraine in 1941. During the occupation of her village by German troops, she worked in the fields plowing them with horses and cows. In the beginning of 1943, the German troops lost the battle of Kursk. That was when they started transporting youth to Germany to serve as a work force. It was July. My grandmother was 19 years old. Germans warned them that they would burn the whole village if nobody would come. My grandmother had no choice. My grandmother went to a transportation center. Germans transported her to Wiedniz, a small town close to Dresden. She was small and her work was to clean and to paint presses at a peat factory. In April 1945, after an attack by Soviet bomber planes, she and her friends escaped and hid in a cave. When the Red Army came, she joined them and helped to build a military airport. Then she helped in a military cafeteria. On Sept. 5, 1945 she returned home. That’s the short story of my grandmother. RBTH: Why have you limited yourself only to photographing veterans from Russia and Ukraine? A. B.: I didn’t choose particular regions like Russia and Ukraine. All the veterans were born in the Soviet Union and fought for the Soviet Union. So I consider them citizens of the former Soviet Union. I met veterans of different nationalities who stayed in Ukraine after the war: Russians, Kazahs, Belorussians, Moldovans, Jews and others. I started the project in Ukraine in 2010 and was shooting there for three years. I thought in those days that the project was finished. RBTH: But you continued it. A. B.: I also was shooting from time to time in Russia, and when the latest events in eastern Ukraine happened, I understood that I needed to do something that would unite people, not divide them. I needed to say something about peace. So I continued my project in Russia. I wanted to show that we are all the same. People suffer on both sides of the frontlines. There is no one truth in this war, and we will not have any winner. All of us will be losers. RBTH: What are veterans are thinking and saying now about the conflict between Russia and Ukraine? A. B.: A lot of veterans are really confused by the current situation. They say that this is the biggest tragedy of the post-World War II era. One veteran said that Russians and Ukrainians fought against Germans in the same army, in the same regiments and in the same trenches, but today we kill each other. It is a disaster. RBTH: How do you find people to photograph? A. B.: To do a good story you need to tell the truth and to be as human as you can. I meet veterans during different celebrations like Victory Day, the day of liberation [ed. A day celebrated in much of Ukraine and western Russia in which a particular city celebrates its liberation from the Nazis] or just in the streets. I also visited disabled veterans in their homes in St. Petersburg, Krivoi Rog (a Ukrainian town) and some Ukrainian villages, including my grandmother’s village. Communication between veterans is very strong. In Ukraine, veterans are forgotten by the government. In Russia, the situation is a little bit different. But they communicate with their comrades from the war and their relatives. RBTH: Are the people easy to contact? A. B.: Many veterans enjoy being photographed. They are happy that somebody is paying attention to them. Sometimes veterans refuse to be photographed. For me it is absolutely normal. We should respect their wishes and their right not to be photographed. It is their choice. Signatures of War_Crowdfunding from Arthur Bondar on Vimeo. RBTH: Where have you already displayed your project? A. B.: The “Signatures of War” project was exhibited in Canada, the United States [ed: at the Palm Springs Photo Festival 2012], France and Ukraine [ed. : at the Ukrainian Embassy in Paris in 2013]. This April we are planning to show it in Moscow at the Sakharov Center. RBTH: You studied in the U.S. in 2012. Didn’t you have a desire to take photos of American veterans? A. B.: I studied in New York for two months with the Magnum Foundation Program. The education was very intense and we had no time for our own projects. Americans have absolutely another way of thinking and understanding of this world. It is another mentality. I always wanted to do stories about my motherland, Ukraine, because I know and feel this nation. I wanted to create a personal story about people who I know well, who are as close to my heart as my grandmother. RBTH: Many people in the U.S. think that Americans were the real factor in the victory over the Nazis in World War II and are not aware of the sacrifices made by the Soviet Union. Did you come across this attitude in the United States? A.B. : I never heard this kind of thing. Americans know their own history very well and analyze it a lot – not as we do. They are very proud and honored by their veterans. These are the things that we can learn from them. At the same time, they are really curious about Soviet veterans and how they live in Russia and Ukraine today.